Mensura huius perspectionis: 415 × 599 elementa imaginalia. Aliae mensurae: 166 × 240 elementa imaginalia | 333 × 480 elementa imaginalia | 416 × 600 elementa imaginalia | 532 × 768 elementa imaginalia | 1 109 × 1 600 elementa imaginalia. 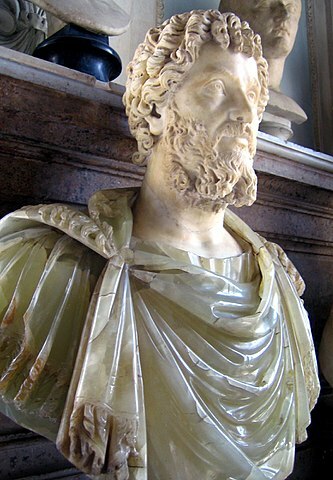 English: Head of Roman Emperor Septimius Severus (193-211 CE) of the Serapis type. Greek marble (head) and green alabaster (bust, does not belong), probably posthumous. Français : Buste en armure avec paludamentum de Septime Sévère, empereur romain (193-211 ap. J.-C.), type de Sérapis. Marbre grec (tête) et albâtre vert (buste, n'appartient pas à la tête), probablement posthume. This image was originally posted to Flickr by antmoose at https://www.flickr.com/photos/antmoose/17433741/. It was reviewed on 5 Ianuarius 2007 by FlickreviewR and was confirmed to be licensed under the terms of the cc-by-2.0.